Pune : Maharashtra Cosmopolitian Education Society organized a rally of students to mark 128th Birth Anniversary of Dr. Babasaheb Ambedkar on Sunday,14th April 2019 at 8.30 am at Azam Campus. 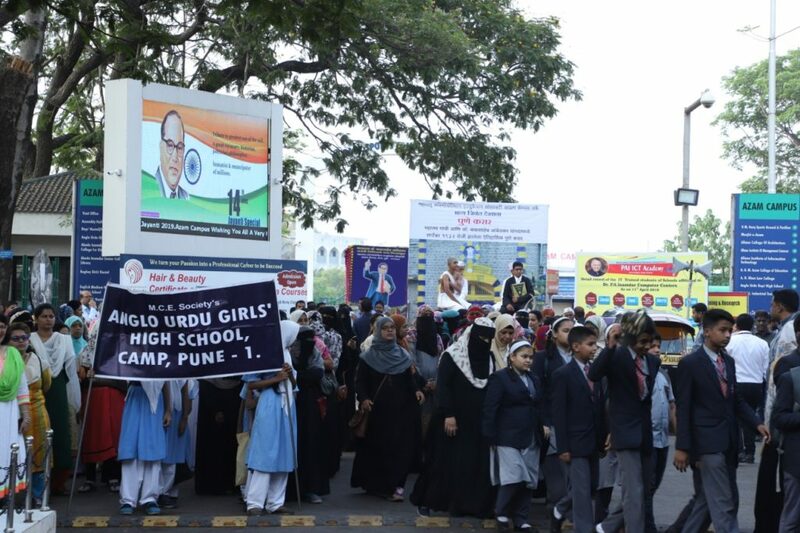 10,000 students from all religions, participated to mark Ambedkar Jayanti in Pune. Rally showcased ‘Pune Pact’ of 1932 through live tableau.’Pune Pact’ is An agreement between Dr. Babasaheb Ambedkar and Mahatma Gandhi was signed on September 24, 1932. Dr. P A Inamdar, president, ‘Maharashtra Cosmopolitan Education Society’ inaugurated the rally.Latif Magdum, Secretory, MCE Society,with staff,students participated in rally procession. Azam Campus to Dr. Babasaheb Ambedkar Statue near Collector office was the route of procession. This is 15th year of the procession. MCE Society, Every year, organises rallies to salute ‘Chhatrapati Shivaji Maharaj’, ‘Mahatma Phule’ , ‘Dr. Babasaheb Ambedkar’ and ‘Hajrat Muhammad Paigambar’.